Wire-to-wire termination: Easily terminate and join wires together. 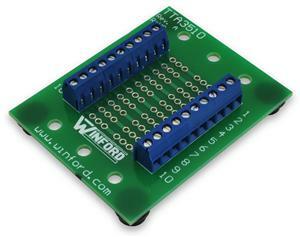 This board comes with each screw terminal connected directly to the corresponding screw terminal on the opposite edge of the board, which allows joining 10 sets of wires (TTA3510) or 15 sets of wires (TTA3515V1). Component holder: Solder pads are provided on the board to allow adding small components such as diodes, capacitors, resistors, etc. To insert a component in series with the screw terminals, cut the appropriate PCB trace in the middle of the board and solder in the component. Note that although the columns of pads are arranged on 0.1" spacing, the rows are not, so this board cannot be used for holding DIP IC chips. For DIP chips, please see our DIP Component to Screw Terminal Adapters. 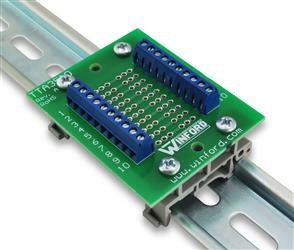 Bus / Distribution: If you are joining a number of wires all to the same connection (such as power, ground, etc), you may wish to solder jumper wires on the solder pads to join additional screw terminals into a bus.